“So bees are dying. It’s hard to be a beekeeper. It’s hard to be a bee. But it’s also really wonderful work.”—Erin Rupp, Beez Kneez, LLC. Beez Kneez, LLC of Minneapolis was founded in 2010 by Kristy Allen to provide a city outlet for her aunt and uncle’s locally produced honey. 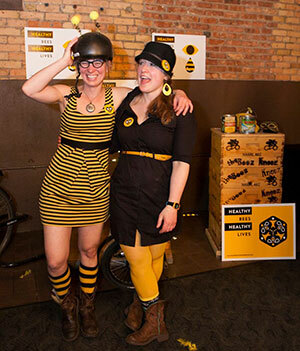 In 2011, co-owner and educator Erin Rupp joined the fun and this bee friendly team of two not only provide honey processing space for local beekeepers, bike raw honey to their customers and educate folks on all things bee related. They’ve also managed to make some pro-pollinator policy changes at the legislative level. In addition to distributing locally extracted honey to restaurants, grocery stores and individual customers in Minneapolis and St. Paul, the company provides pollinator education, consultation on hive set up as well as classes in beekeeping. Extracting honey from the frames is a messy business requiring specialist equipment. With 400-plus members in the Minneapolis Bee Keepers Association, the need for extraction facilities became a real necessity for the Twin Cities’ hive based habit. Already profitable, Beez Kneez wanted to expand their operation by creating a place for locals to extract their honey. The Honey House opened in August of 2013 after a successful Kickstarter campaign allowed Rupp and Allen to offer local beekeepers a place to extract their honey for a minimal fee. The extractor at the Honey House is pedal-powered, a valuable educational tool in sustainability with a practical end purpose. Workshops and classes are held at the Honey House as well as in various locations around the city. Rupp takes her bees and pollinator curriculum to schools and nonprofits to educate locals on the importance of bees, and helps organizations set up their own hives. Bigger issues hit home just after the successful opening of the Honey House at one of their hive locations. The campaign was a grassroots effort instigated by the Beez Kneez and carried to fruition by local stakeholders, concerned citizens, the community of beekeepers and several local politicians. After campaigning, collecting signatures, testifying in front of the legislature and letting anyone who would listen know about Minnesota laws that allowed bee killing chemicals into nursery plants, Krupp, Allen and their pollinator advocates managed to get two laws passed. The first is a beekeeper compensation law that allows beekeepers to petition the Minnesota Department of Agriculture for monetary compensation if they lose bees due to pesticide application. The second is a truth-in-advertising law that disallows plant nurseries from labeling plants ‘bee friendly’ if they have been treated with “pollinator lethal insecticides,” a typical practice in the state. Both laws go into effect onJuly 1 of this year. As Rupp explained, Democratic representatives championed the bill but after some pre session education the vote was passed on both sides of the aisles. Rupp explains that there is still much work to be done in terms of bee advocacy. “Beekeepers make most of their money through pollination, moving bees around the country. Its hidden work and it isn’t government-supported. And it’s totally critical to our food and vegetable production. These guys are aging. Most of them are third or fourth generation beekeepers. We want to see people continue to be beekeepers,” says Rupp. Beez Kneez, LLC. intends to keep adding hives to the downtown area as well as growing attendance for their classes. There is still more demand for their honey than they can currently produce but with some additional help from beekeeping experts this summer Rupp hopes to keep growing bees, honey and interest in pollinators. “In thinking about how to connect people with their food, how it’s grown and how we need to change the food system; yeah, bees tell that story really well,” says Rupp. Living the Sustainable ‘Dream’ in Pittsburgh, P.A.